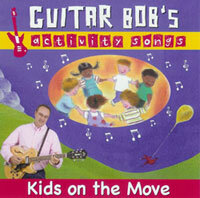 The moment I put in ‘Guitar Bob’s Activity Songs, Kids on the Move’, my 5 year-old perked up and started bopping. He giggled to ‘Captain Coconut’ and laughed out loud to ‘Crazy Weather’. (Snowing chicken feathers?!) On ‘Milkshake & Cherry Freeze’, he timed his predetermined poses perfectly. (Add cheesy smile here.) And so it went with the rest of the Activity Songs CD. Bob Messano is a prolific songwriter, performer, and recording artist specializing in children’s music. Bob’s unique background as a Kindergarten teacher with a Master’s degree in Early Childhood Education lends an authenticity to his work as a children’s musician. Among his many professional accomplishments, he has performed hundreds of concerts for thousands of children in a wide variety of venues. Check the website, www.guitarbob.com to see if there is a concert near you, it’s a great show! If you can’t attend a live performance, I encourage you to pick up the Activity Songs CD. It’s also great in the car and on trips. We really enjoy the happy, upbeat music of ‘Guitar Bob’s Activity Songs, Kids on the Move’, and will keep it in our regular playlist for quite some time. To visit the review site please click here.